Elena Ruiz de la Torre, Executive Director, European Migraine & Headache Alliance (EMHA) said: “Migraine is not just a headache, it is an unpredictable neurological disease which can frequently go undiagnosed and undertreated. After decades of migraine patients feeling left behind, we are delighted to see the progression of preventive treatments which offer patients new hope in managing their condition. The availability of a new treatment, which is specifically designed for the prevention of migraine, is another positive step forward for the migraine community and we welcome the fact that Europe’s more than 50 million patients will now have greater choice over their treatment options and more days uninterrupted by migraine." AJOVY was evaluated in two pivotal Phase III clinical trials that enrolled patients with disabling migraine and studied fremanezumab as a prophylactic treatment for migraine in adults. In these trials, patients treated with fremanezumab had a significantly greater reduction in migraine days compared to placebo. Adverse drug reactions (ADRs) observed with fremanezumab were mostly mild to moderate, short-lasting skin reactions around the injection area: pain, hardening, redness, itching and rash at the injection site. The EC decision is applicable to all 28 EU member states plus Iceland, Norway and Liechtenstein after transposition into legally binding acts in these countries. AJOVY received U.S. FDA approval for the preventive treatment of migraine in adults on 14 September 2018. Additional regulatory filings are underway with other health authorities worldwide. 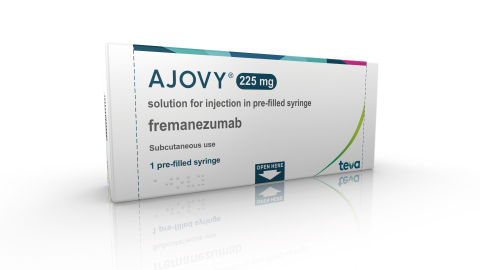 AJOVY (fremanezumab) is indicated for the prophylaxis of migraine in adults who have at least four migraine days per month. AJOVY is available as a 225 mg/1.5mL single dose injection in a prefilled syringe with two dosing options – 225 mg monthly administered as one subcutaneous injection, or 675 mg every three months (quarterly), administered as three subcutaneous injections. AJOVY can be administered in by a healthcare professional or at home by a patient or caregiver if instructed by a healthcare professional in subcutaneous self-injection technique. other financial and economic risks, including: our exposure to currency fluctuations and restrictions as well as credit risks; potential impairments of our intangible assets; potential significant increases in tax liabilities; and the effect on our overall effective tax rate of the termination or expiration of governmental programs or tax benefits, or of a change in our business and other factors discussed in our Annual Report on Form 10-K for the year ended December 31, 2018, including the sections thereof captioned "Risk Factors." Forward-looking statements speak only as of the date on which they are made, and we assume no obligation to update or revise any forward-looking statements or other information contained herein, whether as a result of new information, future events or otherwise. You are cautioned not to put undue reliance on these forward-looking statements.